The leader of Scottish Labour has said the option of remaining in the EU must be on the ballot paper for any further Brexit referendum. Richard Leonard told BBC Scotland that the move could be the only way to break the deadlock at Westminster. Labour leader Jeremy Corbyn announced on Monday that the party would back another referendum if its own proposed Brexit deal was rejected by MPs. Prime Minister Theresa May said this would take the UK "back to square one". 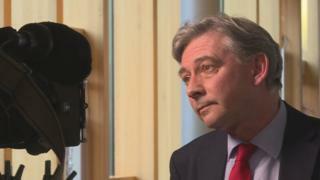 Mr Leonard told BBC Scotland that Labour had set out a Brexit roadmap at its conference last year, which had another general election as its preferred option. But he said the situation had evolved since then, and it would "make sense for there to be a further public vote" if the country was faced with a choice between Theresa May's Brexit deal and no deal. He said the options on offer in any new referendum should be remaining in the EU, and a "credible Leave option". The MSP added: "Parliament has been unable to deliver an exit option. We will be putting forward again this week a proposal which is based upon an exit option which we think provides a soft Brexit. "If parliament supports that then we believe that will get us out of the impasse that we've reached. "But what we've said clearly is that if parliament does not support that then we think that we are really left at this eleventh hour with little option but to call for a People's Vote, and a People's Vote including the option of remaining in the EU." Media captionTheresa May: "An extension cannot take no deal off the table." Speaking in the Commons on Tuesday, the prime minister said she would put her withdrawal agreement - including any changes she has agreed with the EU - to a meaningful vote by 12 March. 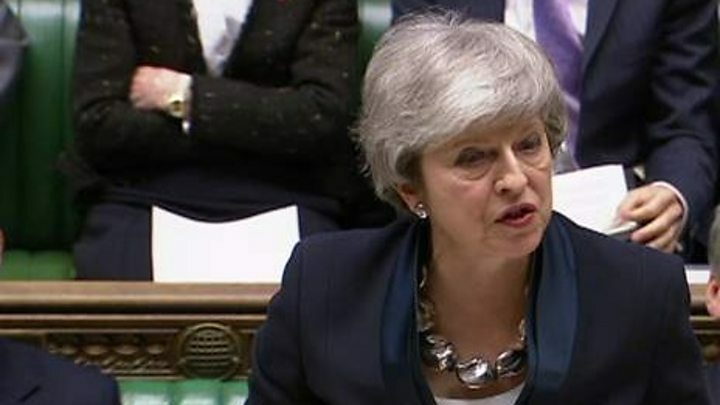 The prime minister stressed that she does want to want to see Brexit delayed, and that her focus remained on securing a deal and leaving the EU as planned on 29 March. On Tuesday, she told MPs that a "divisive second referendum" would "take our country right back to square one". Mrs May added: "This house voted to trigger article 50, and this house has a responsibility to deliver on the result. The very credibility of our democracy is at stake. By leaving the EU with a deal, we can move our country forward. "If we can leave with a deal, end the uncertainty and move on beyond Brexit, we can do so much more to deliver real economic progress to every part of country." Scottish first minister and SNP leader Nicola Sturgeon said Mrs May's move was "cynical manoeuvring to try to bully MPs into accepting her bad deal". The SNP later tabled an amendment to Mrs May's Brexit motion, calling on the prime minister to immediately rule out a no deal Brexit "under any and all circumstances" and regardless of exit date. The party's Westminster leader Ian Blackford said the prime minister "could not be trusted" not to "dodge" another meaningful vote. Mr Blackford has now written to all Scottish Tory and Labour MPs, asking them to "join the SNP in standing up for Scotland's interests". He said: "Leaving the EU with either Theresa May's bad deal, or with no deal at all, is a false choice that would be devastating for Scotland." Mr Blackford claimed it would "destroy up to 100,000 jobs, damaging living standards, and inflicting lasting harm on our economy and public services". He added: "Scottish Tory and Labour MPs must finally join the SNP in standing up for Scotland's interests - by voting for this amendment and taking a disastrous No-Deal Brexit off the table once and for all."